Vega has brought European design and innovation to the North American market. The streamlined design and visual appeal gives our displays a distinctive style. At Vega Manufacturing we are more than just a mass-producer of display cases. We custom design showcases to suit each customer’s individual needs, from required lengths to preferred finishes. In addition to providing top-quality showcases, we will also help design the retail area of your store to maximize the use of space available. 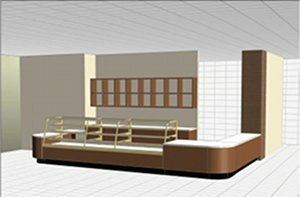 Utilizing AutoCAD we are able to create unique solutions for all of your display needs. We work with architects, managers, and owners to help design the best possible showcase solution for each individual product. Talk to one of our design experts, and we will help turn your concept into a reality. No project is too difficult; we have provided showcase solutions for a variety of unique locations. 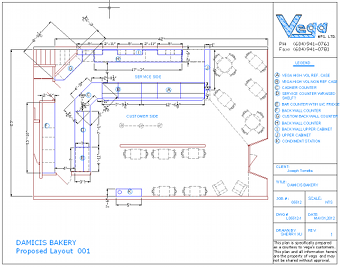 We are always looking for the next challenge, and our design team is ready to create your dream bakery, deli, or coffee shop.